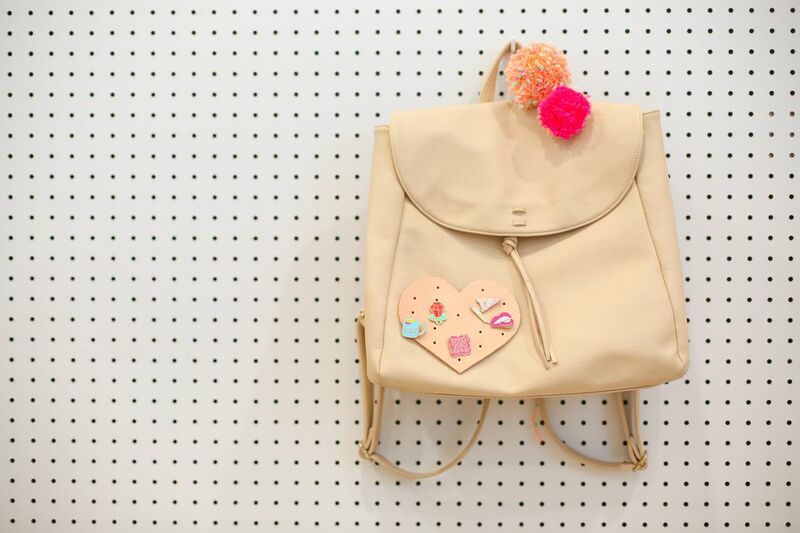 Does Your Backpack Need Some Sprucing Up? Got some flair burning a hole in your jewelry box? Here's a perfect way to display it all without punching holes in all of your clothing. With this simple DIY backpack flair patch, you can switch out your pins on the daily and keep both your flair and your backpack safe, sound, and damage-free. It's the perfect way to show off all those pins and patches, and make your backpack a one-of-a-kind gallery of your favorites. Customize the shape, size, and color of your patch to really make it your own! Start by gathering all of your materials. Make a template on plain paper by drawing and cutting out the shape that you'd like your patch to be, like this simple heart. Other fun ideas could be letters, numbers, a hashtag, or a simple rectangular patch. Use your imagination, and keep in mind the shape and size of your backpack as you're creating your patch. On the back side of the leather, trace the template using a pen. Cut out the leather shape carefully along the traced line. We recommend cutting with strong, sharp scissors to be sure your cuts are clean and precise. Every so often, check the front side of the leather to be sure your cuts look clean on both sides. Decide how many holes you'd like in your patch. Arrange them in a grid using the ruler, and mark each place where a hole will be with a small dot using the pen. Be sure that you leave enough space between dots for your pins. It's smart to test out spacing by placing a few of your pins on the patch first and deciding how much space you'd like between the holes. Use the leather punch to punch a hole on each dot that you marked. Place the punch on the front side of the leather and the base of the punch on the back side to avoid making any additional indentations as you punch. Put a strip of adhesive velcro together so that the two sides grab. Cut the strip into three small pieces. Remove the backing of one side of each of the pieces and adhere them to the back of your patch according to the directions on the packaging (this will ensure the strongest adhesion). Remove the other piece of backing from each piece of velcro and adhere it to your backpack according to the directions on the packaging. Once the velcro is firmly adhered, remove the patch to add your flair and velcro it back on. Wear that flair loud and proud!